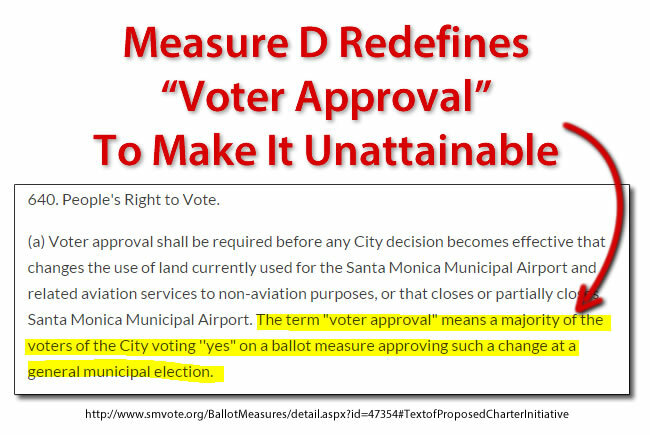 Measure D is worded specifically and deliberately to keep the airport operating exactly is it is today – with no changes whatsoever – unless another vote is cast in the future. But here’s the deception: It would redefine a “voter majority” to mean a majority of voters, not a majority of votes. This would make any future voter approval effectively unattainable — since we barely get a majority of voters actually voting in most elections. This isn’t just about whether or not the airport will be closed. It means there would never be any new restrictions on the frequency of flights, the type and size of aircraft, the sale of leaded fuel, or any new safety measures, pollution limits, or noise abatement. If Measure D passes, we will no longer control our own land. 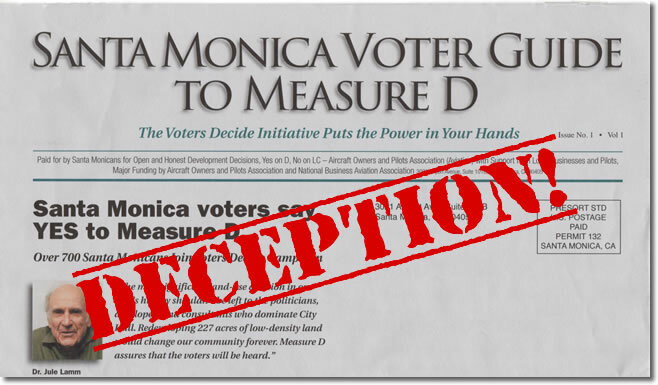 The pro-Measure D campaign claims that they “made a mistake” – and only intended it to require a simply majority. But don’t let them fool you: They do not make mistakes like this (and if they do, what other mistakes might be in the initiative?). If it was just a simple majority, why did they try to redefine it? The people who wrote this initiative are well-paid attorneys who specialize in ballot measures. And even if they did make a mistake, intent doesn’t matter: The language highlighted above is in the initiative, and that’s what we’ll be voting on this November. The City Attorney’s “Analysis” also incorrectly states that it would require only a simple majority–even though the text of the initiative plainly says otherwise. You’re not going to be voting on the analysis, you’ll be voting on the language in the initiative — and that’s all that matters right now. Note, too, the inclusion of “approving such a change at a general municipal election.” That means that we would only have the remote possibility of changing anything about the airport–no matter how trivial–once every two years. Several of our community members took the city to court over this initiative, asserting that it was deceptive and should be removed from the ballot. Not surprisingly, the courts dismissed the cases, saying the cases were filed prematurely, and could only be addressed if Measure D actually passes. We encourage you to read the full text of Measure D. Be sure to scroll down and read section 640(a), where they redefine a voter majority. Don’t let them take your power away from you: Vote NO on Measure D.